I don’t make new year’s resolutions (I’m not overly-burdened with resolve), but I do like new year plans, and really get into that whole thing, as I’m a sucker for novelty and anything that allows me to buy new notebooks. However, before any new reading challenges, etc, can start, I need to clear the decks of everything I’m currently reading, which will give me the motivation I need to finish the utterly awful Don Quixote. Then I can fully embrace what I want to do next. So far, I have decided to need to get to the Shakespeare plays I’ve missed, as I’d like to end 2016 having read every one of his plays, and I also remembered I said in the comments section of a post on Book To The Future that I’d like to do the whole set of Émile Édouard Charles Antoine Zola’s (his mum probably couldn’t decide which name she liked, so went with them all) Rougon-Macquart novels. There’s twenty of them, and I’ve read one already, so only nineteen to go, whoo! An article I read says they are not designed to be read in order, and as some are better than others, and if attempting to do the lot, mixing them up a little and starting and ending on a high note with the more exciting volumes is a good idea. So, ‘Germinal’ will be the first Zola book I read in 2016. There is still of course the Dickens challenge, and no way with Sarah or myself will be finishing that any time soon. After hating almost every word of ‘The Old Curiosity Shop‘ I have been shying away from Dickens, and just wish I could read Bleak House again. I think the next one will be ‘Our Mutual Friend’ as no one has ever told me anything bad about that. 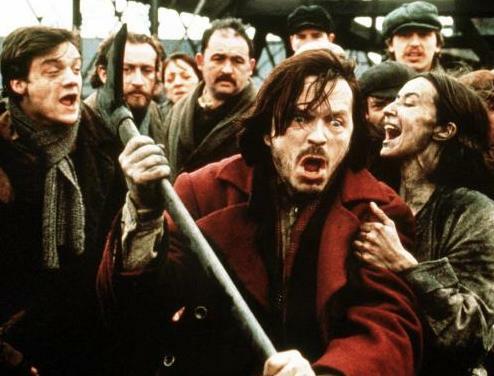 A still from the 1993 film of ‘Germinal’. Looks cheery. ← Really Great Theatre Is For Life, Not Just For Christmas. I got a good way into Our Mutual Friend before getting distracted (must get back to it) and it’s utterly wonderful! Ah yes the other 19 books…I haven’t gotten any closer either, although Dickens seems a smoother run, apart from Hard Times which is short but really grim…and oddly the book that got me onto the great man. I’m not sure what your criteria are for choosing books to read. Is it arbitrary? Is it broadly “the Great Books”? Is it simply to read a certain number of great works per year? For you, what is the act of reading? What are its benefits? How can you be sure that you reaping those benefits? There was a list published a little while ago of the 100 greatest novels, listed in chronological order (there’s a link at the top of the home page to our progress) as picked by various writers, critics, and academics. It’s thing like that so far we have based our lists on, or a particular theme or author. For me the act of reading is and the benefits of it are all tied into one, it’s communication, across time ans distance, and I know I’ve benefited if I feel something have been communicated to me, that has stayed. God, Lucy, are you still suffering with Don Quixote? I would have given up ages ago! I should think that you’ll have a fuller sense than anyone by the end of next year just how lucky we all are to be born when and where we were. Will all that death after unfortunate accidents of birth help you in your rather unusual job btw? I don’t know if it will help me, but may have the same effect, in that death and Zola both make me value life more. They enhance my appreciation of the little things, and make me want to do a Julie Andrews and burst into a song about buttercups, baby seagulls and Tunnock’s Tea Cakes. 🙂 And I’ll need a lot of tea cakes to make it through 19 Zola novels. Absolutely, no point rushing it if you like it. I want all my hard slog/work books out of the way, when 1st January dawns. I was going to start ‘The Count of Monte Cristo’ but what with Spenser and Cervantes still to do, I might regret it! I can’t wait to hear how you get on with the wonderful R-M cycle. I actually read Germinal fairly late on in my protracted working through Zola’s novels (it took me far longer than one year!) but it’s a great place to start. I’m quite excited, too! The only one I’ve read is La Bete Humaine and it was quite an interesting romp through misery and murder, so I might have to start Germinal before 2016 begins 🙂 I have a feeling it will take me more than a year, too. I have to be able to blog about other books as well, and could probably use some cheery books in-between times.